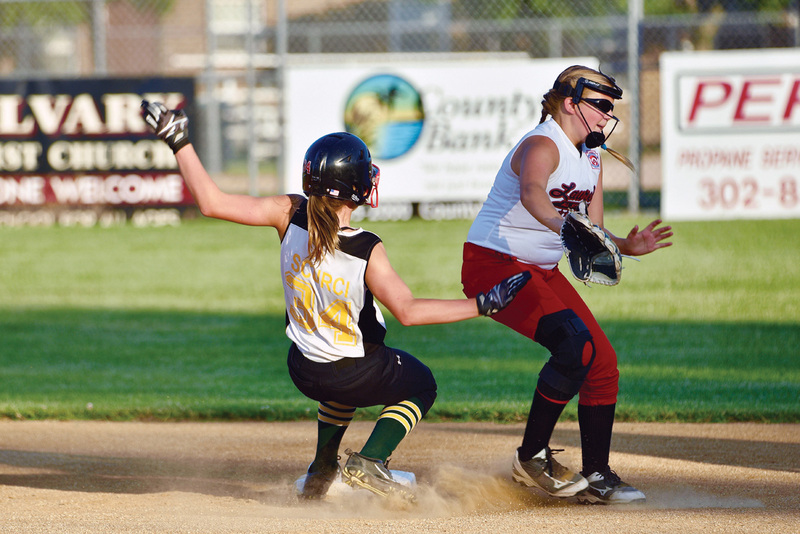 Sophie Scurci tries to get back to second base in LSLL’s 11-10 loss to Laurel on Saturday, July 21. Success and disappointment are both common in sports, and such was the case for the Lower Sussex Little League 8-10 girls’ softball team this postseason. Having cruised through their first three District 3 games, the LSLL All-Stars were sitting in a great spot, having to win just one of their last two games to claim the district crown. The Laurel Little League team had other plans, though. After taking the first winners’ bracket contest 7-5 last Friday, July 13, Laurel overcame a 9-3 deficit in the sixth inning to outlast LSLL 11-10 in 10 innings to rip the title right from the fingertips of LSLL. Cierra Lewis was impressive in the circle for LSLL through the first five innings. The 8-year-old making her first all-star team had stymied the Laurel bats through those five innings, allowing just three runs. However, she ran out of gas in that sixth inning, with three walks and allowing a hit for Laurel to cut the lead to 9-7. Gracie Hoban came on to get a strikeout for out No. 2 in the inning. However, Laurel would go walk, double, walk and single over the next four batters, to tie the game. LSLL did have a chance to win the game in the bottom of the sixth, as Sophie Scurci led off with a walk, but she was thrown out on a close play at second base that was argued for obstruction by LSLL coaches. Jasmine Mayfield then walked but rounded first base too far, and was tagged out by the Laurel first-baseman. Again, LSLL coaches disputed the call, but to no avail. Katie Lasher then grounded out to the pitcher to force extra innings. Laurel scored the decisive run in the 10th, on a leadoff single, stolen base and another single.